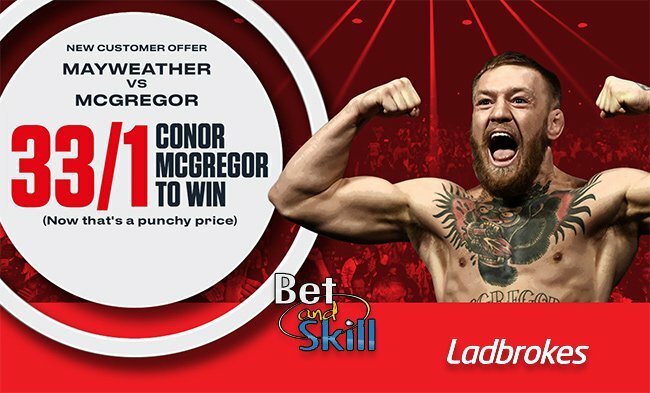 33/1 Conor McGregor to win vs Mayweather at Ladbrokes + money back! The fight of the century between Conor McGregor and Floyd Mayweather is just around the corner and bookmaker Ladbrokes are offering the best price boost to upset the unbeaten boxing champion! Claim 33/1 for Conor McGregor to beat Floyd Mayweather, plus money back if you lose! The odds for Conor McGregor are shortening after UFC president Dana White posted a footage of the 'Notorious' sparring the Paulie Malignaggi where we can see McGregor knocking down the former IBF and WBA World Champion with an impressive left hand! Are you backing Conor McGregor to win? Don't miss this offer! Get a terrific 33/1 Conor McGregor to win the fight! Join Ladbrokes via our special links and claim 33/1 for Conor McGregor to beat Floyd Mayweather! New Ladbrokes Online & Mobile customers: Simply register today, deposit a minimum of £/€5, and then place your first bet as a single bet of £/€1 on McGregor to beat Mayweather (33/1). Bets placed in accordance with the terms and conditions will be eligible for the enhanced odds of 33/1 on McGregor to win. Maximum one qualifying bet per customer. If the bet loses, we will refund your stake up to £/€1 as a free bet, paid into your account within 24 hours. The offer is not available through Telebetting, Text Betting, Ladbrokes Exchange or in Ladbrokes shops. Customers that have an existing Online account with Ladbrokes do not qualify for this promotion. Winning bets will be settled at the standard price and the additional winnings from the enhanced price paid into your account within 24 hours. The extra winnings will be paid as a free bet token. Free Bets can be redeemed through Online or Mobile only. Free Bets must be used in their entirety as a Win Single on any sport and cannot be split into multiple stakes. A Free Bet cannot be partially redeemed. If you attempt to place a bet for a lesser total stake than the value of your Free Bet, the remaining value of the Free Bet will be void. Ladbrokes accepts no responsibility for system or connection problems that might affect any end user during the promotion. "33/1 Conor McGregor to win vs Mayweather at Ladbrokes + money back!"